I visited that same dirty, desolate place a year and a half later, to surprisingly find myself in a spotless shiny room, fully equipped for the production of beer and the exposure of their own brewing equipment (Slowbeer). The team had also grown to catch up with all the tasks related to the various lines of work, ranging from the supply of raw materials for brewing, to training sessions for amateurs and professionals, or even innovation in processes or ingredients. 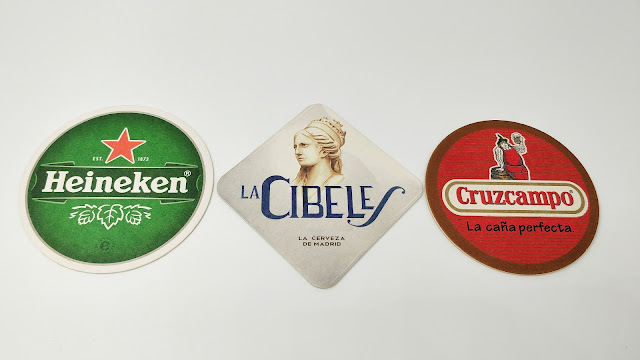 An example of it would be a recent project that took them to malt renowned local rice from the Delta de l'Ebre with the idea to produce beer with a growing sense of locality. If that was not enough, since last Sunday they have their own brewpub: Abirradero. Just 20 meters apart from their microbrewery, it becomes a powerful retail extension for their beers. The bar joins a well-equipped kitchen with a variety of up to 40 taps, with three different temperatures for serving. The offer is half their own brews, half beers of microbreweries from other Mediterranean countries such as Portugal or Italy. 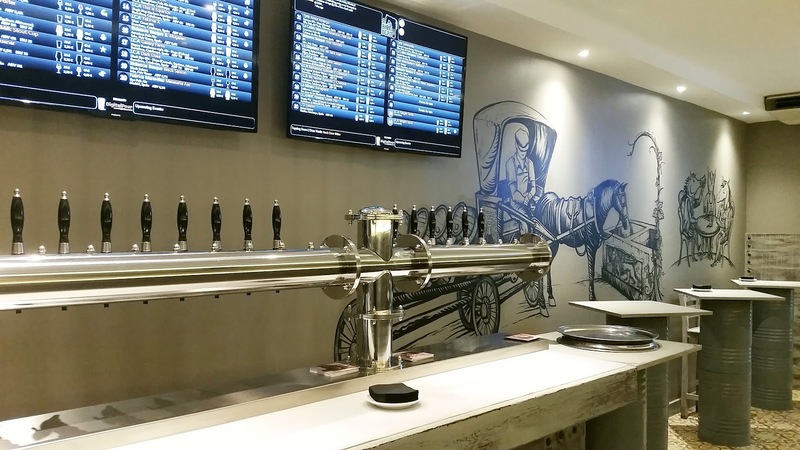 All the beers available on tap informed on two different digital displays, located at the entrance and also behind the bar. The place takes its name from El Abrevadero (The Trough) a mythical restaurant of the early twentieth century in the city, while inspired aesthetically by the historical drinking troughs that can be found just in front of it. That's where the horses of the carriers and carters who were heading to the port could rest and quench their thirst, while their owners did the same at the bar. Thus, both the design and decoration of the brewpub plays with the images of horses, giving the restaurant a modern style but with some rustic touches. At the launching party on Friday, 9th of October, I arrived early enough to visit the premises while still empty, something I think it will not be easy from now on. An afternoon of talks and beers, in which I could taste 5 different beers matched with some dishes prepared for the occasion. In regards of food, I enjoyed the salmon marinated with Chinook hop oil, as well as the mini burgers, or a delicious dessert called Birramisú, a tiramisú with Stout instead of Rum. 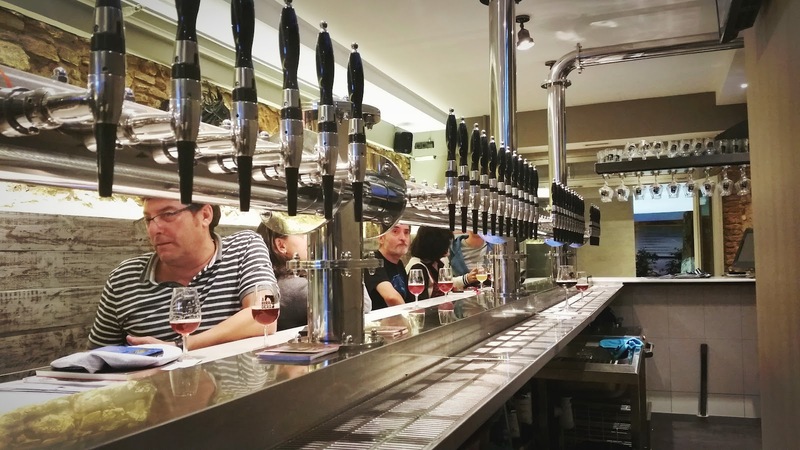 A small tasty sample of the great gastronomic potential of this new pub from the constantly-evolving Barcelona beer scene. Beerwise, I would especially highlight Fakeneken, an absolutely delicious Helles of classical inspiration, soft and full of flavour; possibly the best interpretation of the style brewed locally. Furthermore, it would be unfair not to mention Galaxy Farm, a contemporary Saison that, as one could easily deduce, makes good use of Australian Galaxy hops to bring its distinctive aroma and flavour, ranging between passion fruit and citrus. A beer that would be up to scratch if compared to similar references from the big names of the European brewing industry. Satisfied with what I had seen and tasted, I thanked them the invitation to the première and said goodbye to some beer mates with whom I had shared the afternoon. Upon leaving, I found myself halfway between Sala Apolo and El Molino, two icons of the bygone entertainment scene in Barcelona from last Century. Living testimonikes to the transformation of the Paral·lel area, and Poble Sec in general. 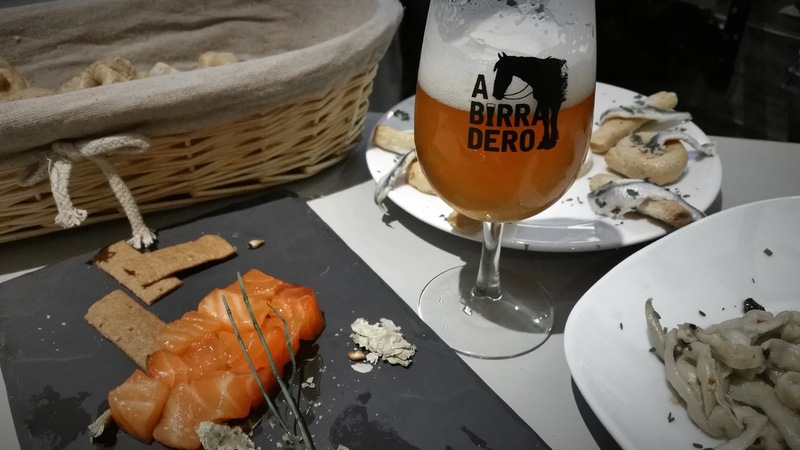 A neighborhood, with close ties to the beginning of our alternative brewing scene, that is slowly experiencing an evolution with the opening of new beer oriented businesses, with Abirradero as its most recent example. Located in an area with a ​​high flow of people, but with a kind of entertainment that values price over quality (except for the theaters) I can say once again: "Lots of work ahead!". Time will tell wether the pub turns into an attractive leisure choice for all this new potential audience that passes through the area. But sure enough, Nereus, Dani and company have already proven that they are hard workers who do not lack determination. I remember the day I met Nereus Garbin. 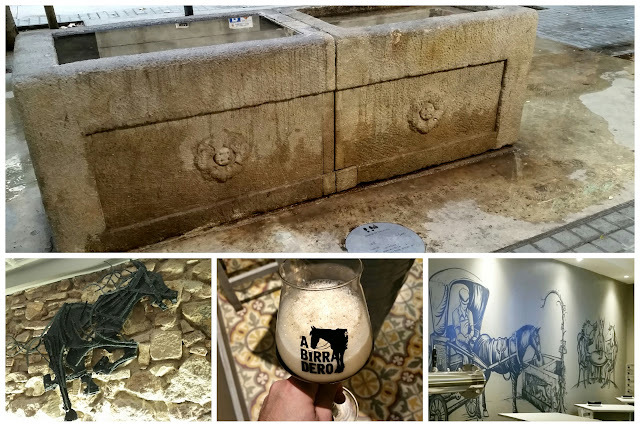 We were at the offices of Artisan Beer Institute (ICA) in Poble Sec, also with Daniel Fermun, whom he had met in the bar and Extinct Chop & Beer Madrid. We had a long talk in which we could meet, exchange views on the local beer scene and take some beers. They told me about his long career in the brewing world and its future projects, showing me a black, greasy store in the basement of the same building, which had operated a workshop for cars for years, and where they planned to locate its brewer. "They have no job, no nothing! ", I thought. Well Worth a visit. When in the Region. Enjoyed the Northern Ireland Post, too. Somewhere Else i have Not Been. This Week. Busy, Sheffield Beer Festival. Wednesday - Saturday. Attending Wednesday with Czech Guest,s. Also, just Started , Wetherspoon Beer Festival. With all it,s Sheffield Outlet,s. Thanks for your comment Terry. Yes, it really is worth a visit. I have never been to Sheffield, but would love to in the future. I met Jules from Hop Hideout in Dublin and Brussels and will someday pay a visit. And if possible during a Beer Festival :-). I had never heard of Wheterspoon's Beer Fest; interesting. Cheers!